In 1832 Hamilton used mathematics, that strange abstract language of symbols and axioms, to predict something truly absurd, and obviously physical nonsense. He was right. It was the first time mathematical prediction preceded experiment. It was a sensation... for a while. It would take 170 years to fully understand, and not surprisingly. Because mathematics is still alive, still evolving, still new and full of mysteries even two centuries later. Hamilton's prediction continues to stretch the capability of lasers and computers of the modern age, and embodies all of the complexities of multiple-scales and singularities that plague modern science. 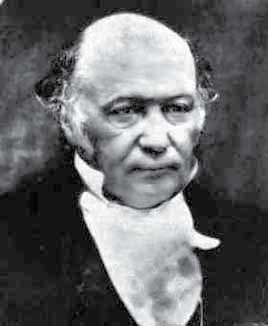 William Rowan Hamilton, a few years before being bestowed with a knighthood, predicted a singularity, a point where light's deterministic journey through a simple crystal broke down. The calamity would be observable within Fresnel’s theory of double refraction, seen as a single ray exploding into infinitely many rays, neatly arranged a brilliant cone. In one stroke, the field of singular optics was born and a sensation began that would take 173 years to run its course. Despite prompt experimental confirmation of Hamilton's beautiful mathematical theory, the phenomenon was long hindered by controversy and misconception. 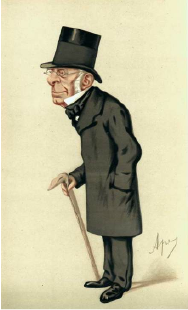 Victorian mathematics contained only the initial sparks of the asymptotic techniques which would be needed to achieve a full understanding. Sensing defeat of the wave theory, double refraction was chosen as the subject of a prize competition by the French Academy of Sciences in 1808. Etione-Louis Malus was the victor following his discovery of polarisation by reflection, and his winning theory was questionably interpreted as unpholding the corpuscular philosophy. Augustin Fresnel reversed this triumph in 1816 by presenting his transverse wave theory, developing on principles established by Thomas Young (transverse waves) and Huygens (wavefront propagation). In a few short years he discovered the wave theories of refraction and diffraction, and gained the Academy prize for Diffraction in 1818. Details of this fascinating period in history are in Whittaker (1951). Hamilton’s formulation of geometrical optics married the wave theory of Fresnel with the ray method of Newton. Describing light rays as the normals to level surfaces of some characteristic function, the theory was first published in 1828 (Hamilton 1828). In it he also discussed light caustics, which would feature once again, 170 years later, in my PhD work on chiral conical diffraction. In his first supplement Hamilton extended his method to diffraction, but the most refined and general form is given in the extensive 3rd supplement (Hamilton 1837), where lies the theoretical prediction of conical refraction. This phenomenon, considered “in the highest degree novel and remarkable” (Lloyd 1837), was a consequence of four degeneracies in Fresnel’s wave surface. In a biaxial medium Fresnel’s wave surface has two sheets associated with two (ordinary and extraordinary) rays of double refraction. 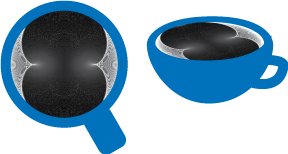 A pair of distorted ellipsoids, the surfaces intersect at four points that lie along Brewster’s optic axes. This was known to Fresnel and Airy, and had been studied extensively by James MacCullagh who unsuccessfully tried to claim that the physical effect was implicit in his work “when optically interpreted” (Graves 1882). 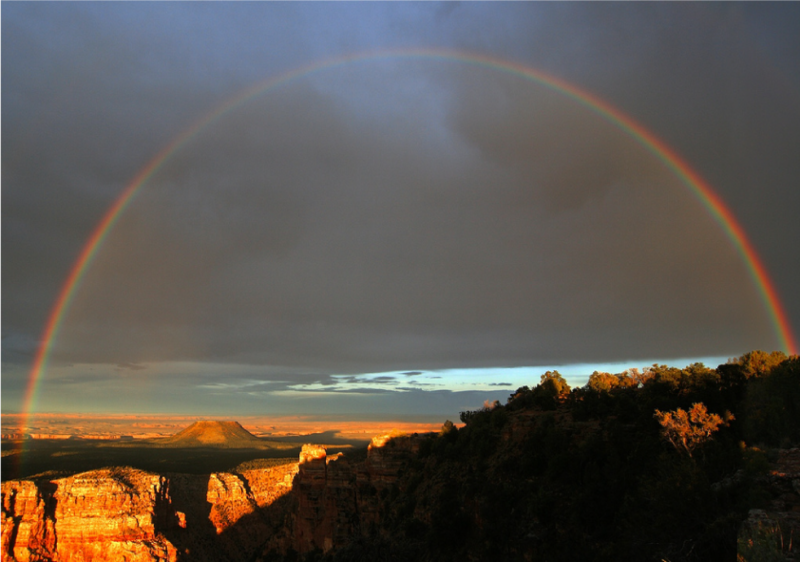 But the connection between the precise geometry and the physical phenomena resulting were conceived of only by Hamilton (Graves 1882, O’Hara 1982). Along the optic axes, the wave surfaces are conical in shape, their apexes touching to form a diabolo. Rays normal to the surface would then be infinite in number, and form a narrow cone. Later in life Hamilton, in correspondence with Guthrie Tait, reformulated his theory of conical refraction in terms of his quaternions (Wilkins 2005). Gibbs would not develop the vector algebra descending from quaternions for another twenty years. The asymptotic methods now used to understand conical diffraction can be traced back to the study of Bessel’s equation by Carlini in 1817 mentioned by Watson (1944). Profound contributions to the burgeoning field of integral asymptotics were made by Stokes, who in his study of Bessel functions confessed in correspondence to his future wife that “I tried till I almost made myself ill” until, at 3 o’clock in the morning, “I at last mastered it” (Stokes 1907). Although the Victorian importance of asymptotics in rendering integrals calculable is less significant in the computer age, it has become clear that only through asymptotics can the wave and ray phenomena of conical diffraction be understood. A detailed history of phase integral asymptotics can be found in Heading (1962). Experiments in conical diffraction have been revolutionised by the advent of the laser, and in return conical diffraction has provoked interest in focusing and transforming laser beam modes. With technological advances in the manufacture of novel synthetic crystals, conical diffraction may prove to be of further interest. Recent years have also seen an explosion of experimentation in the optics of microspheres, minimal energy surfaces formed in the phase transitions that produce aerosols, colloids, and photonic crystals (F`eve et al. 1994, Kofler & Arnold 2006). Table: Historical summary of conical diffraction experiment parameters, including principal refractive indices n1, n2, n3, cone angle A, crystal length l, beam width w, and the image-to-object ratio ρ0 encompassing all six. To verify Hamilton’s prediction of conical refraction Lloyd had to overcome poor quality specimens of macled (polycrystalline) arragonite, helped eventually by a “fine specimen” obtained from Dollond, London. Lloyd possessed a profound understanding of the phenomenon, mentioning to Hamilton in a letter of December 18, 1832 (Graves 1882) that one should expect his prediction to be affected by some perturbation due to diffraction. He did not subsequently take this up, perhaps because he was unable to resolve such effects in his experiments, the most detailed description of which is given by Lloyd (1837). 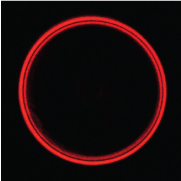 The picture below taken from this paper shows why: the thickness of the bright ring is such that it appears almost as a filled disc, because Hamilton’s cone, of which the ring is a section, has barely reached a great enough radius to exceed the incident beam width. Figure 1.1: Lloyd’s discovery of conical refraction: the transition from conical (a) to double (e) refraction, viewed through aragonite with a pinhole on the entrance face, illuminated by a distant lamp, reproduced from Lloyd (1837). Lloyd discovered that the polarisation in the external cone is linear and rotates only half a turn in a circuit of the axis (he then proved this theoretically, in analogy to the same effect for the internal cone already predicted by Hamilton). Lloyd’s measured cone angle (see table above) differed from Hamilton’s prediction by only five minutes of arc. The conical refraction pattern of a nonchiral transparent crystal can be characterised by just one dimensionless parameter, the ratio ρ0 of the cone radius at the exit face to the incident beam width. 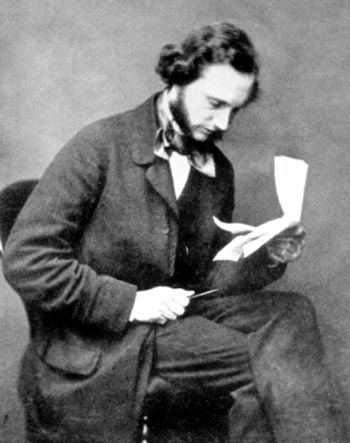 Lloyd’s experiment utilised various pinholes that he did not specify, but the largest, used by ingeneous method to determine the cone angle, was 0.016 inch (to 1-500th inch) in diameter, giving a measured ratio ρ0 = 0.98 compared to Hamilton’s theoretical ρ0 = 1.02. This small ratio explains the poor resolution of figure 1.1(a), barely sufficient to verify the existence of the singularity predicted by Hamilton, but little improvable using the technology – oil lamps, sunlight, and handmade pinholes – of the time. Figure 1.2: Conical diffraction of a pencil of rays along the optic axis of a biaxial crystal: the range of ray directions give rise to a pair of ray cones (bold) which encompass the dark cone (dashed) of Hamilton’s mathematical conical refraction, and their refraction at the exit face. 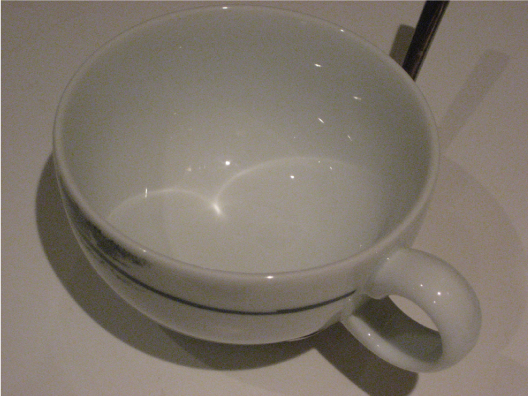 Figure 1.3: The conical refraction lunes: a pair of bright rings encompassing Poggendorff’s “coal black sliver”. 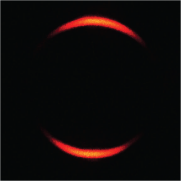 The polarisation pattern in the rings is shown, overlaying a typical theoretical intensity image obtained either: with a vertically polarised incident beam, or with an unpolarised incident beam viewing the refracted rings through a vertical polariser. According to Poggendorff the experiments seem to have obtained the reputation of being hard to carry out, at least ‘on the continent’. Indeed little detailed experimentation was reported as having been done, despite a few references to cursory examinations by Voigt in theoretical papers around 1905 (1905a, 1906, 1905b, 1905c) and an article by Raman (1921); Raman described an “arrangement for demonstrating conical refraction usually found in laboratories”, and noted that the observed field beyond the crystal was not yet well described, let alone understood. This was corrected by Raman et al. (1941, 1942) using purpose-grown crystals of naphthalene. With a cone angle more than ten times greater than aragonite, naphthalene is much more suited to observing conical refraction. Although napthalene sublimes at room temperature, images were obtained which remained unsurpassed throughout the century. 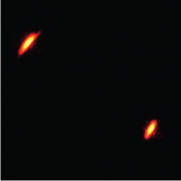 These showed the conical refraction pattern evolving from focused rings to a farfield axial focal spot. They concluded incorrectly from their observations that there is only a single ring in the focal plane because they could not resolve the dark ring, a consequence of their extremely large ring-radius to beam-width ratio shown in the table above. ￼￼A detailed comparative study of theory and experiment was carried out by Schell & Bloembergen (1978a), who were hampered by reverting to aragonite, but aided by lasers with a 30 micrometer beam width (see table 1.1). They obtained very good agreement with theory, but limited their investigation to the exit face. They also provided the first, and to our knowledge only, detailed images of the phenomenon in the presence of optical activity (Schell & Bloembergen 1978b). They again did not go beyond the exit face but photographed a polarisation pattern resembling a coffee swirl. This pattern occurs with a linearly polarised incident beam and was first described by Voigt (1905b), but has evaded any detailed understanding. Photographic images obtained from Schell & Bloembergen (1978b) are shown in figure 1.4 for later comparison to our theory. Limited nonchiral images were obtained more recently by Perkal’skis & Mikhailichenko (1979) with sulfur. Far more striking is an experiment described by F`eve et al. (1994) with a spherical crystal of KTP, where curvature modifies the evolution of the pattern but does not fundamentally alter the phenomenon. (This approach offers a useful method for studying conical diffraction, see appendix B of my Thesis). Recent advances in the technologies of lasers and synthetic crystals also make possible a more detailed study of the original phenomenon (see e.g. section 4.6 of my Thesis). Figure 1.4: Photographs of chiral conical diffraction in α-iodic acid crystals with a gaussian incident beam: (a) crystal length 1.4mm, beam width 60μm, and beam vertically polarised; (b) crystal length 2.5mm, beam width 30μm, and beam horizontally polarised. Reproduced from (Schell & Bloembergen (1978b) fig.5B and fig.6A) with permission of the publisher. We now turn to the theoretical development of conical diffraction. Hamilton’s most extensive, refined, and characteristically loquacious account of his approach to geometrical optics was published in his 3rd Supplement to an Essay on the Theory of Systems of Rays (Hamilton 1837). In this he introduced his method of characteristics, showing that light rays are paths of minimal optical path length. This is now known as Hamilton’s principle, on which we base the geometric theory. When applying his method to double refraction, Hamilton rederived Fresnel’s equations for the two-sheeted surface formed by a wave front propagating from a point within a biaxial medium. By a detailed study of the surface he discovered four singular points, lying along two crystal directions called the optic axes, at which the two sheets of the wave surface intersect at a point. Importantly he showed that, close to the intersection, each of the sheets is conical in shape, so that the degeneracy is often referred to as a conical or diabolical intersection, or “conoidal cusp” by Hamilton and his contemporaries. Rays of light are given, in accordance with Hamilton’s principle and the constructions of Huygens and Fresnel, by the normals to the wave surface, and so in general there are two such normals in any given direction. At the conical point, however, there are an infinite number of normals forming the surface of a cone. This is the phenomenon of internal conical refraction: a light ray incident upon a biaxial crystal in the direction of an optic axis will be refracted into a cone of rays. This cone is refracted into a hollow cylinder at the exit face, and should be observed as a bright ring of light beyond the crystal. Hamilton also found a circle of contact surrounding each conical point, where the surface could be laid “as a plum can be laid down on a table so as to touch and rest on the table in a whole circle of contact” (Graves 1882). 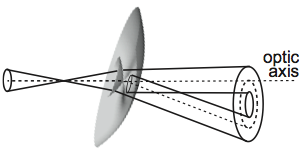 This gives rise to external conical refraction, whereby a ray in the crystal aligned with the optic axis refracts out of the crystal into a diverging cone. We will be concerned mainly with internal conical refraction. The two are subtly connected by geometry familiar to Hamilton, though he seemed to overlook the physical relation. This would not be understood by Raman for another 110 years. The history of conical refraction contains many such curious oversights: Fresnel was aware of the optic axes but missed the conical point; MacCullagh studied the conical intersection but missed its physical significance; Hamilton studied the conoidal cusps and tangent circles and the physical phenomena they produced but missed their interrelation; Hamilton and Lloyd neglected the differences between a physical light beam and an ideal ray, though Hamilton gave it thought, expressing in a letter dated January 1st 1833 (Graves 1882) that he had “predicted the facts of conical refraction, but I suspect that the exact laws of it depend on things as yet unknown”. Conical refraction is a rich haven of singularities. Not until 1905 did Waldemar Voigt (1905a) realise an interesting paradox: the infinity of rays refracted in the cone is nulled by the zero intensity of Hamilton’s ideal axial ray, so Hamilton’s cone should be dark, not bright. This prompted him to call the phenomenon “sogenannte konische refraktion”, signifying that Hamilton’s ideal conical refraction does not exist. Instead, double refraction in the neighbourhood of the conical point gives rise to pair of concentric cones, separated by a dark cone where Hamilton’s bright one should be. 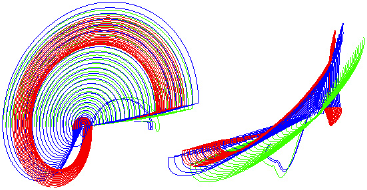 This is in keeping with Potter’s overlooked observations depicted in figure 1.2, and the corresponding wave surface construction shown in figure 1.5. Voigt’s description is qualitative, though following Hamilton he gave equations for ray directions, a practice that would be followed by many future authors. Voigt noted that the intensity of light, propagated through a crystal in a given direction, is proportional to the area element of the wave surface from which light rays originate. 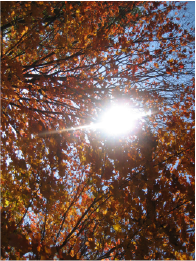 Since the area of the conical point is zero, the intensity of light coming from it is zero. But any beam of light contains a range of wavevector directions, a statement of practicality in Voigt’s time that would later become embodied in the Uncertainty Principle. Voigt was also the first to extensively discuss conical refraction in optically active crystals, noting firstly that optical activity removed the conical point degeneracy (Voigt 1905c) and therefore conical refraction was destroyed. Elaborating on this later, Voigt (1905b) noted that the exact geometry of the surface still led to a brightening in the optical axis direction. In a detailed investigation of the wave surface he showed that the normals formed a caustic, though neither he nor future authors seem to have concluded the striking physical phenomenon that would result. He also discussed the effect of pleochroism (Voigt 1902, Voigt 1907), identifying two further directions in the neighbourhood of each optic axis, the singular axes, where light would be completely circularly polarised. Later Pancharatnam (1955a) considered absorption in the vicinity of the optic axis, superposing the effects of birefringence and dichroism, though not in the conical regime. Figure 1.5: The diabolical point: the mathematical picture corresponding to figure 1.2, showing the diabolical intersection of the biaxial wave surface, Hamilton’s cone of normals (dashed), and the cones of rays refracted from around the conical point described by Voigt (bold). The connection between internal and external conical refraction was first correctly appreciated by Raman et al. (1941, 1942). They described the importance of focusing and the changing light pattern away from the crystal. The most focused image of the conical refraction pattern appears in the focal image plane inside the crystal. They correctly described that by moving away from the focal plane one explores directions on the wave surface (figure 1.5) away from the conical point. 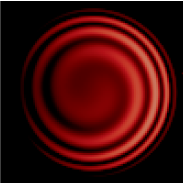 As the two sheets of the wave surface separate, the rings – one from each sheet – separate and diffuse. The extraordinary sheet has a turnover where a tangent plane touches the sheet in Hamilton’s contact circle, and where ray normals are focused along the axis. 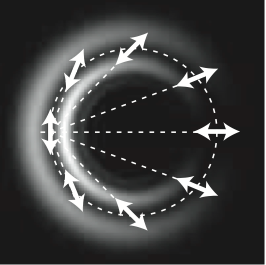 As this direction is approached, the inner ring focuses into an axial spot and dominates the intensity. This level of geometric description is very powerful in describing the phenomenon of conical diffraction. A quantitative understanding requires many levels of geometrical optics and diffraction theory, the development of which has proved troublesome over the last 60 years. Attempts to quantify the theory continued with calculations of the Poynting vectors of wave bundles in the crystal (Portigal & Burstein 1969, Portigal & Burstein 1972), an approach which had been successful in the study of acoustic conical refraction (McSkimin & Bond 1966). These, and other attempts expressing the electric field as an angular spectrum of plane waves (Lalor 1972), with improvement and a stationary phase approximation by Schell & Bloembergen (1978a), Uhlmann (1982), and for nonlinear crystals Shih and Bloembergen (1969), contained analytical formulae too complicated to yield a much greater understanding of the phenomenon than had already been achieved. But these marked a resurgence in interest that was rewarded by the triumphant diffraction theory of Belskii & Khapalyuk (1978), where simple circularly symmetric diffraction integrals were first written down. Though the underlying theory has evolved and improved, the resulting integrals for biaxial crystals remain the same. Their success showed that a paraxial diffraction theory could capture the long familiar polarisation structure. They gave the first simple expressions for conical diffraction of light from an illuminated pinhole for thin slabs in terms of Legendre functions. At the time a lack of experimental data prevented verification of their theory. Little progress was subsequently made though interest remained, largely in using conical refraction for transforming the growing array of beam modes made available by laser technology (Belafhal 2000, Stepanov 2002), as well as for laser beam focusing (Warnick & Arnold 1997), and exploiting the dispersive stability of conically diffracted beams (Brodskii et al. 1969, Brodskii et al. 1972, McGloin & Dholakia 2005). Recent interest has also centered around inhomogeneous media, where diabolicity is a localised phenomenon (Naida 1979). Conical refraction was also used by De Smet (1993) to demonstrate the efficacy of the 4 × 4 matrix approach to optics. The next major breakthrough came in the form of numerical computations by Warnick & Arnold (1997). Seemingly unaware of the Belskii-Khapalyuk theory, they represented the electric field by a dynamical Green’s function (Moskvin et al. 1993), and were able to uncover structure beyond that seen by Schell & Bloembergen (1978a). 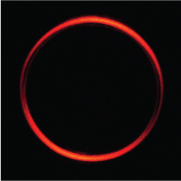 They simulated the spread of the bright rings away from the crystal to discover secondary oscillations on the inner ring. They also drew attention to the fact that oscillations had been seen in the chiral images of Schell & Bloembergen (1978b), the theory for which was unknown, remarking on whether the two interference phenomena were related (we will see they bear no relation). Belsky & Stepanov (1999) extended the theory to gaussian beams, and presented numerical calculations in the thin slab regime similar to Lloyd’s experiments where the rings are barely resolvable. They did not consider thick enough slabs to correspond to experiments with good resolution, a distinction embodied in the cardinal ring-to-beam ratio ρ0. Therefore they were unable to see the well developed conical diffraction rings or Warnick and Arnold’s secondary oscillations. The importance of diffraction in the phenomenon was emphasised by Dreger (1999), though with a theory too complicated to see the effects. Belsky & Stepanov (2002) extended the Belskii-Khapalyuk diffraction theory to optically active crystals. They verified the polarisation pattern observed by Schell & Bloembergen (1978b) and described as long ago as Voigt (1905b), though without a good qualitative understanding of the origin of the structure. Berry & Dennis (2003) studied the polarisation singularities associated with conical and singular points in direction space within the crystal. They described three key types of degeneracy: (i) in a nonchiral transparent crystal there are the optic axes, marking conical points of the wave surface, which in the presence of dichroism split into a pair of singular axes, branch points of the complexified wave surface which approach as chirality is added, eventually annihilating when optical activity dominates; (ii) there are C points in direction space where plane wave eigenstates are circularly polarised, on the optic or singular axes in absence of optical activity, which obey a ‘haunting theorem’ as optical activity is introduced, remaining fixed in the location of the departed singular axes; and (iii) there are L lines where polarisation is linear, separating space into regions of right and left handed circular polarisation. The stage for my 2007 PhD thesis was set by Berry (2004b), with a Hamiltonian reformulation of the Belskii-Kapalyuk theory. Through an asymptotic study of the diffraction integrals for general incident beams, the first detailed explanation of the conical diffraction phenomenon was achieved by Berry, both qualitative and quantitative. The state of affairs was thus raised to a sophisticated level of understanding, and all aspects of the biaxial phenomenon thus far observed were explained. It was in this paper that Berry introduced the ratio ρ0 that characterises the phenomenon. My thesis complements and extends that work, taking an approach contrary to historical development, giving first the exact Hamiltonian wave formalism, followed by its interpretation in the geometrical optics limit as a simplest approximation. Then we ‘sew the wave flesh on the classical bones’. This is the methodology of asymptotics since Keller (1961): interpreting the exact solution by building up from its dominant asymptotic behaviour and then adding on diffraction piece by piece, thus extracting the full physical phenomenon from an intractable wave theory. In this manner we extend the theory to study conical diffraction in optically active and anisotropically absorbing media. As it stood prior to my thesis, little was known about how chirality would effect the phenomenon of conical diffraction, and nothing was known regarding dichroism. From my own point of view, my PhD was a delectable introduction to ray and wave geometry, and a first taste of integral and exponential asymptotics. It was my second early experience at grappling with singularities. It was an invitation into long-silent shelves housing dusty Victorian tomes that documented optical experiments conducted by candlelight, and explored mutli-dimensional geometries decades before vector and characteristic methods took to the stage. And it was fun. The two key papers introducing conical refraction were Third Supplement: On Conical Refraction (1837) by William Rowan Hamilton and On Conical Refraction (1837) by Humphrey Lloyd. Potter's overlooked contribution is here. And even our most delicate mathematical predictions have started to be seen in experiments, by ourselves here, and from conical refraction's home town of Dublin, see 1, 2, and 3. To discover more about Hamilton's personal life, you can read notes on A Victorian Marriage. And here's one last word or two from Hamilton, just because I love it: On Symbolic Geometry (1839) by William Rowan Hamilton. Nothing is so fatal to the progress of the human mind as to suppose that our views of science are ultimate; that there are no mysteries in nature; that our triumphs are complete, and that there are no new worlds to conquer.. Updated April 2015 by MrJ.